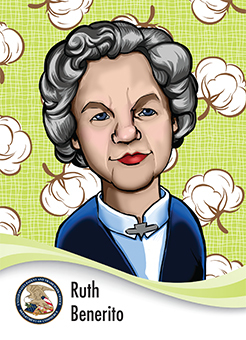 Ruth Benerito, was a research chemist at the U.S. Department of Agriculture (USDA), Southern Regional Research Laboratories in New Orleans, where she led the team that invented wrinkle-free cotton. She holds over 50 U.S. patents, most related to cotton. She also pioneered a method of delivering intravenous nourishment to wounded soldiers too sick to eat. The delivery system was used during the Korean War.